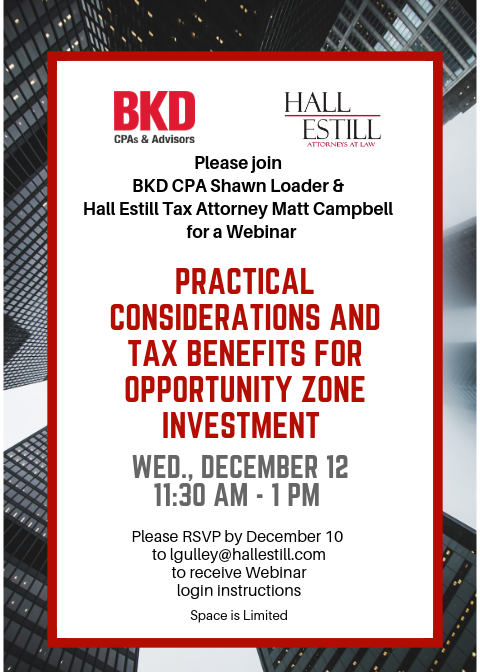 Hall Estill Tax Attorney Matt Campbell and Shawn Loader with BKD CPAs & Advisors will present a webinar "Practical Considerations and Tax Benefits for Opportunity Zone Investment" December 12 from 11:30 a.m. to 1 p.m. The proposed regulations for Opportunity Zones (a new community development program established by Congress in the Tax Cuts and Jobs Act of 2017 to encourage long-term investments in low-income urban and rural communities nationwide) are out and we want to make sure everyone knows how they may take advantage of the program. If you are interested in joining this webinar, please RSVP to lgulley@hallestill.com to receive instructions.